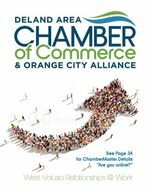 Please join your Orange City Alliance, Deland Area Chamber of Commerce Members, Board and Ambassador teams as we celebrate and welcome the Grand Opening of Seminole Estate Auction & Liquidators. Wednesday, Feburary 6, 5:00pm. Ribbon Cutting at 5:30pm.